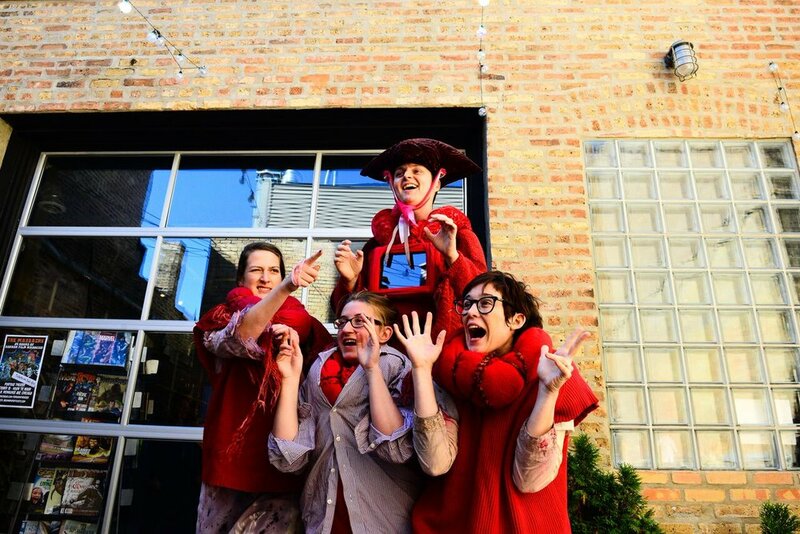 Before founding Upended Productions, Artistic Director Noelle Krimm was creating full-length multi-disciplinary productions for the Chicago Neo-Futurists, where she was an ensemble member from 1999 to 2008. In 2004, the first version of Alice, produced by The Neo-Futurists, was an exciting departure from conventional theater experiences. It required audience members to be the main character, chasing their Wonderland experience through the streets, alleyways, and storefronts of a local Chicago neighborhood. Shows sold out, critics raved, and business owners were thrilled by the increased attention. Even better, artists befriended and collaborated with local entrepreneurs and with one another, strengthening vital neighborhood networks. Throughout the whimsical and comic episodes, there are consistent reminders of the subjective nature of reality, a medicine that goes down easily, delivered as it is with a bit of sugar—not pepper—and a wry touch. In 2009, Noelle created Fear, a multi-disciplinary, ambulatory production produced onsite at the Neo-Futurarium. Touted as a “thinking man’s haunted house,” Fear asked local theater, visual, dance, and puppet artists to reimagine stories and poems by Edgar Allen Poe. Taking place in the various rooms, hallways, and staircases of the Neo-Futurarium (with some spillover into the alley behind the theater), the show was a critical and box office success. Ingenious visual work ... and evocative performances add up to a mournful, creepy, fervently imaginative exploration of Poe's nightmares—and our own. Upended’s inaugural performance was the 2014 reboot of Alice, featuring a host of new multidisciplinary performers interpreting chapters of Lewis Carroll’s fantastical book. Similar to its predecessor, the show was a hit, playing to enthusiastic crowds and stimulating dialogue between community stakeholders. Noelle quickly realized that Alice could be easily replicated in any community with “win-win-win” results for artists, audiences, and local businesses. She is currently developing frameworks that allow other theaters, colleges, or community organizations to partner with the Upended team in creating their own neighborhood Wonderlands. Upended Productions provides performance frameworks for artists of all stripes—actors, dancers, filmmakers, puppeteers, musicians, visual artists, and more—to come together and create unexpected, innovative, multidisciplinary work. Our shows are not confined to conventional theaters. We perform in and around community spaces, surprising and delighting audiences and stimulating artistic collaboration, social interaction, and the local economy. [Alice] displays impeccable logistic skill and a striking sense of space; in the best environmental theatre tradition, it renews the audience’s sense of wonder at their surroundings.